Wainwright packs a lot into the last day of the walk. In doing so, we weave about a bit. When you look at a map you can see that if you flew, as the crow flies, due east from Grosmont, you'll hit Robin Hood's Bay in just under eight miles. But we're walking 15. At least we start off east. After watching the steamer steam off, we puff our own way steeply up out of the village. This takes us onto moorland which we follow, passing some standing stones, until starting to drop again. We cross a road and follow a track down to Littlebeck. Across the stream, through a little gate and then we're into a great little woodland path. The wood is packed with interesting things, such as a cave, a hermitage carved into the sandstone, and Falling Foss - a nice shampoo-advert type waterfall. Next to the splashy water is a cafe so we can get a quick cream tea in. Once out of the wood heading south we turn and head north across one more moor. Once we reach Hawsker it's time to head south again along the dramatic coastal path. A one-hundred-and-sixty-five year-old dinosaur backbone was found jutting out of the sandstone here in June 2015. 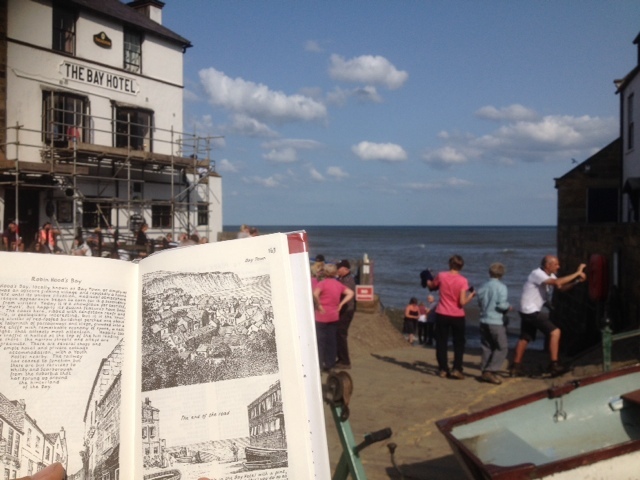 Finally, as you walk along the cliff, you get a view of Robin Hood's Bay. It's a picturesque little place. In an old ballad Robin Hood is getting a bit bored of the woods and decides to become a fisherman. And there a fisher-man will bee." When he gets there they end up having a fight with some French pirates. There's an action scene with lots of bow and arrow stuff and the fishermen win thanks to Robin. He donates his share of the spoils to the locals and they call their village after him. And it shall stand on Whitby strand. The masse untill the day I dye. Hee com no more upon the see." It makes for a fitting location to finish a walk across the country. So we walk down to the slipway, dip our boot in the sea, skim our pebbles from St Bees into the North Sea and then go for our well earned pint in the Bay Hotel. One way of not getting lost would be to do a guided walk. Then someone like me would look after you, lead the way, point out things of interest and you can just relax and enjoy your walk. If you prefer to go it alone here's a few tips on guidebooks, maps and some spots to watch out. quirky guidebook. The problem with the guidebook is that, for all it's charm and beauty, it's not much good to navigate by. That said, the mile markers given on the maps are useful for gauging your progress. Worth getting a copy for nostalgia, nice pictures and to get into the head of the man behind the walk. The trailblazer guidebook is incredibly useful. They have hand drawn maps at a scale of 1:20,000 that show exact details of the route. The maps are also pretty useful for estimating timings. There are also up to date details of accommodation options, food options and public transport arrangements. There are other guidebooks available and some of them are better for chat and historical information. From the perspective of navigation they are not as useful as the mapping tends to be too large a scale (1:50,000 in the Cicerone guide for example) to be much use on this walk, and following a written description of the route is less helpful. Harvey maps have pulled off a neat feat by designing maps specifically for walkers. The C. to C. maps are split in to "east" and "west" sections so you'll end up not getting much change from £30. The map punches above it's scale, 1:40,000, and the cartography is simplified to be clearer and of more use to walkers. Each section of the walk is split into panels so the whole walk is condensed into two lightweight maps. The maps are also waterproof apparently. A number of year's ago the Ordnance Survey let other people buy the rights to their maps to create unique products. 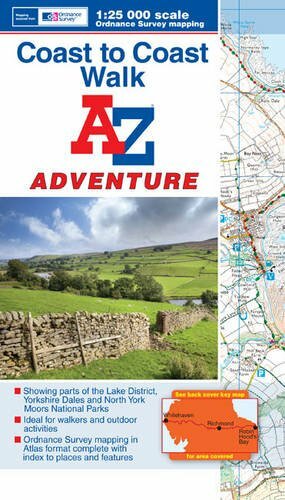 A to Z have been particularly ingenious in creating OS atlas books for interesting places in their "adventure" range. 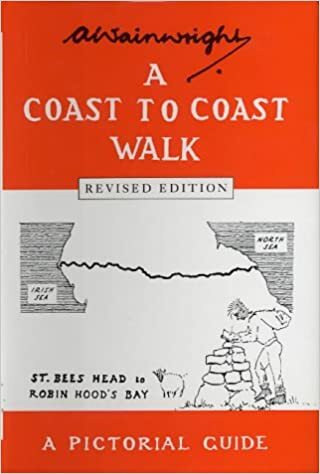 A book is actually a handy form for walking a long distance route and having 1:25,000 OS maps is fantastic. If it's raining it fits neatly into a map case. My only gripe is that the book is a bit flimsy and mine is starting to fall to bits after two C. to C.s. But then it was only about £8. You'd need about eighty quid's worth of Explorer maps (and the added volume) to equate. With a bit of sticky back plastic this flaw can be rectified. I've also added approximate timings and mile marks to mine to make it all I need to follow the route precisely. Because of the way it was conceived, the C. to C. is not an official long distance trail. As such the signage is inconsistent, poor, or (as in the Lakes) non-existent. Here's a few places people often walk off in the wrong direction. You want the faint trail towards Tounge Gill, not the obvious track. After passing Satura Crag you want to follow the wall down to the clear track towards Sulphury Gill. There is an obvious track up Rest Dodd a lot of people follow by mistake. Having made it past Rest Dodd, make sure you make the sharp left hand turn to Kidsty Pike just after the Knott.